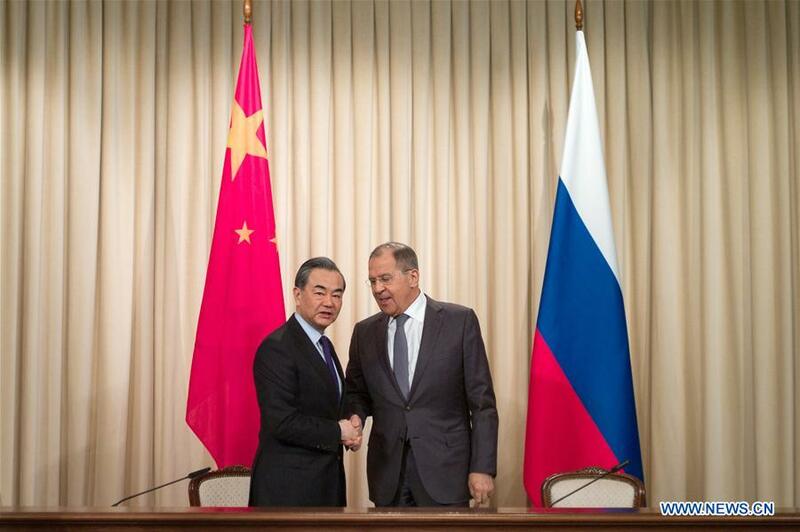 MOSCOW, April 5 (Xinhua) -- China-Russia relations are at the best level in history and the two countries need to further strengthen their cooperation in view of various uncertainties on the international and regional agenda, Chinese State Councilor and Foreign Minister Wang Yi said here Thursday. At a press conference following talks with Russian Foreign Minister Sergei Lavrov, Wang, also special envoy of Chinese President Xi Jinping, congratulated Russian President Vladimir Putin once again on his re-election with record support rate, recalling that Xi was also elected Chinese president by a unanimous vote last month. He said that the results of the presidential elections of China and Russia fully manifested that the paths of development of the two countries are supported wholeheartedly by their peoples. China believes that under the leadership of President Putin, the Russian people will unite as one and keep on achieving new accomplishments in national rejuvenation and development regardless of difficulties, Wang said. In the meantime, China will continue to support Russia's efforts to safeguard its own rightful and legitimate interests and play a bigger role in international and regional affairs, he said. Noting that current international and regional situations are still full of uncertainties, Wang said China and Russia, as close strategic partners, need to strengthen their communication and cooperation. Wang said the fact that he was visiting Russia as the special envoy of President Xi showed that China attaches great importance to the development of its relations with Russia and reflected the priority of the bilateral ties on the respective diplomatic agendas of the two countries. During the talks, the two ministers held in-depth discussions on bilateral ties and crucial international and regional issues, according to Wang. They agreed that current China-Russia relations are better than ever. With the pairing of the Belt and Road Initiative and the Eurasian Economic Union, major projects are actively promoted in such fields like energy, investment, infrastructure and aerospace, Wang said. Cultural cooperation is also in full swing as the "years of China-Russia local cooperation and exchange" are being held this year and the next, which opens up new space in the bilateral relations, he added. As for cooperation on international affairs, Wang said China and Russia will work actively together to push forward a political settlement on major issues and enhance coordination within the framework of multilateral mechanisms including the United Nations, the Shanghai Cooperation Organization and the BRICS. In view of the complicated international situation, China and Russia, as permanent members of the UN Security Council and comprehensive strategic partners of coordination, need to strengthen and prioritize coordination with each other, especially on their major policies and actions, so as to safeguard regional and global peace and stability, Wang said. President Putin is scheduled to visit China this year, and the two heads of state of the two countries are also expected to meet on a number of other important bilateral and multilateral occasions, he said. China and Russia will coordinate in preparation of a series of activities on the highest level and implement agreements reached by the heads of state afterwards, Wang said.